Last week it was revealed that Campaign Monitor was to merge with Emma and Delivra to launch new Campaign Monitor Brand. The global email marketing company now proudly promotes their three products as one family. Could this latest announcement deliver the most comprehensive email marketing solution suite of three SaaS products in the industry? I invited Cody Bender onto my podcast to find out more. 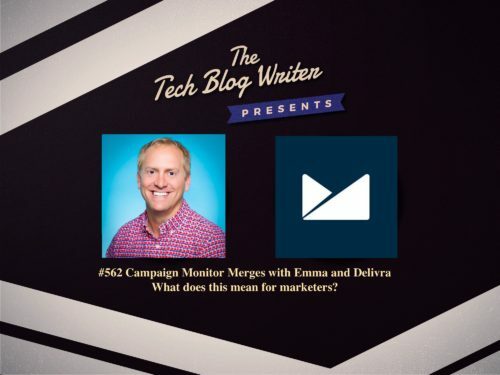 Through the three products—Campaign Monitor, Emma, and Delivra—the merger will help provide a full range of email solutions to help marketers create meaningful, lasting connections with their audience. But what does each other? and what does this mean for Marketers? Campaign Monitor: This market-leading self-service brand focuses on delivering a better experience compared to freemium brands, with a primary focus on high volume email senders trying to drive more engagement with subscribers. With its easy to use marketing tool, marketers are able to send beautiful, targeted newsletters to grow their business. Emma: Emma’s solution makes it easy for teams of all sizes to create and collaborate on beautiful campaigns. Its focus on delivering powerful personalization in an accessible way ultimately drives more conversions and sales. Emma also allows distributed business or franchised organizations to manage professional email marketing at scale. Delivra: Delivra offers custom email marketing and automation solutions designed to meet the unique needs of every customer. Its service-centric model focuses on building more sophisticated, custom email solutions for businesses who have advanced email marketing needs but lack the resources to support it. Cody Bender is the Chief Product Officer of Campaign Monitor. Before joining Campaign Monitor in early 2017, Cody led Return Path’s Email Certification program and Product organization for six years, working with some of the largest ISPs, ESPs, and email marketers in the world. Before that, he developed and implemented software solutions and telecom engineering for municipalities and governments across the US. Follow Campaign Monitor on Linkedin, Facebook, and Twitter.